As far back as I have memories books have been front and center in my life. My mom read to us all the time and made sure there were plenty of books for us 5 kids. Birthdays, Holidays and just because books were given to us. I have wonderful memories of trips to the book store to meet authors to sign our books, even Babar the Elephant at one book event. Books are very important to my family and its a love I now share with my own son. Not only is my son learning as I read to him and he "reads" in his own way back to me (he is almost 3 years old) but its a time we can bond as a family. Libraries were something we were lucky enough to have access to. Once we even lived next door to a huge library it was Awesome!!! Sadly this is not the case in many homes. Many families and educators do not have the resources to buy books for their own children or students. The thought that kids do not have the chance to sit down and read a book at home makes me beyond sad. Books not only teach kids to read but they teach them to be creative and to see the world through a different perspective. Students who do more reading at home are better readers and have higher math scores. Students with more types of reading materials in the home also demonstrate greater reading proficiency. 67% of fourth graders in the U.S. are reading below a Proficient level, according to the most recent National Assessment of Educational Progress. 61% of low-income families have no books for children in their homes, and more than 80% of the preschool and after-school programs serving at-risk children have no books at all. Approximately 8.7 million fourth through twelfth grade students struggle with required reading and writing tasks in school. For many adolescent students, ongoing difficulties with reading and writing figure prominently in the decision to drop out of school. 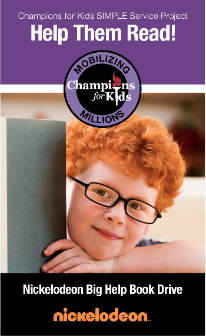 For the month of September Champions for Kids Simple Service Project will be a Nickelodeon Big Help Book Drive. I am so excited to be a part of this project. Books are so special to me and I feel like every home should be full of them. My son and I headed to Walmart to shop for books to donate. I found many cute Nickelodeon books with the characters we know. There was Dora the Explorer, Go Diego Go and Sponge Bob. I was looking for Blues Clues too but did not spot him. We found many great books to donate at low prices. My son loves books as much as I do and had a blast helping me pick out the books for us to buy. Our book section had many books to select from. I wish it was bigger but that's just because I LOVE books! These are the books I have collected just in the last few days for my Champions for Kids Nickelodeon Big Help Book Drive. I have the books I purchased at Walmart and a few others that neighbors have given me. I have only just started to collect donations and I look forward to seeing how many books we can collect for a local charity. I have selected a local charity that I know could use these books. They house families in transition from being homeless to independent living in sustainable environments. These families could be any of our neighbors that have lost jobs and then lost their homes with no where to turn. I feel this charity can use the book donation to give to the children that live there. There can be as many as 30 kids living at the charity transitional homes that need these books to make sure they can get the quality reading they deserve. For more ideas on what types of books Walmart has to buy for your donation, including the awesome Bargain Bin you can read my Google+ Story. *I am a member of the Collective Bias™ Social Fabric® Community. This shop has been compensated as part of a social shopper insights study for Collective Bias™ and Champions for Kids. #NickCFK #CBias All opinions expressed in this post are my own. I love Champions for Kids. The Simple Service Projects are always something I can afford to do. You are off to a great start on your donations!! Great job! You picked lots of great books. Can't wait to see where you donate them! Your passion for books will make such a difference to those transitional houses. You are right, that could be any one of us right now in this economy. Today we're fine! Tomorrow we're unemployed and wondering where our kids will get their next meal. Books will not be of importance at that point! But they are important. You are doing an incredible thing! Can't wait to see the follow up post for this one!